Adair County is a county in the U.S. state of Iowa. As of the 2010 census, the population was 7,682. Its county seat is Greenfield. The county was part of Iowa's 5th congressional district, which had a score of R+9 (strongly Republican) in the Cook Partisan Voting Index. 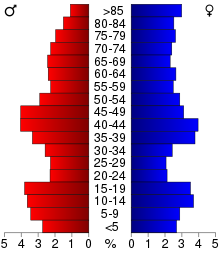 Adair County was formed in 1851 from sections of Pottawattamie County. It was named for John Adair, a general in the War of 1812, and the eighth Governor of Kentucky. According to the U.S. Census Bureau, the county has a total area of 570 square miles (1,500 km2), of which 569 square miles (1,470 km2) is land and 1.0 square mile (2.6 km2) (0.2%) is water. As of the 2010 United States Census, there were 7,682 people, 3,292 households, and 2,148 families residing in the county. The population density was 13.5 inhabitants per square mile (5.2/km2). There were 3,698 housing units at an average density of 6.5 per square mile (2.5/km2). The racial makeup of the county was 98.4% white, 0.3% Asian, 0.1% American Indian, 0.1% black or African American, 0.4% from other races, and 0.7% from two or more races. Those of Hispanic or Latino origin made up 1.3% of the population. In terms of ancestry, 42.9% were German, 12.6% were Irish, 11.9% were English, 6.7% were Danish, and 6.4% were American. Of the 3,292 households, 26.8% had children under the age of 18 living with them, 54.9% were married couples living together, 6.7% had a female householder with no husband present, 34.8% were non-families, and 30.7% of all households were made up of individuals. The average household size was 2.29 and the average family size was 2.84. The median age was 45.3 years. The median income for a household in the county was $45,202 and the median income for a family was $57,287. Males had a median income of $38,638 versus $31,642 for females. The per capita income for the county was $23,497. About 5.7% of families and 10.6% of the population were below the poverty line, including 13.5% of those under age 18 and 11.4% of those age 65 or over. As of 2000[update], 67.9% of the population (5,597) had a declared religious affiliation, in every case Christian. 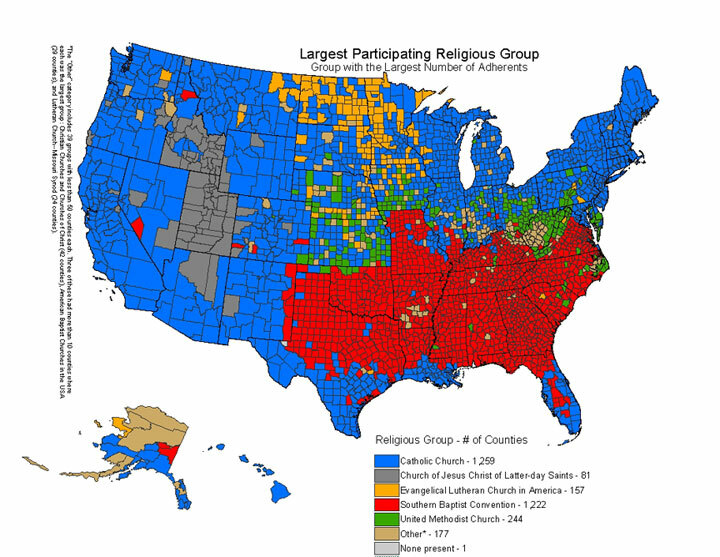 The leading religious denomination was the United Methodist Church, with 23.6% of the population (1,944 members); second was the Lutheran Church–Missouri Synod, with 15.4% (1,268 members); third was the Roman Catholic church, with 12% of the population (1,003 members); and fourth was the Evangelical Lutheran church, with 11.8% of the population (978 members). Orient-Macksburg Middle School and High School. The population ranking of the following table is based on the 2010 census of Adair County. ^ a b "State & County QuickFacts". United States Census Bureau. Archived from the original on July 6, 2011. Retrieved July 13, 2014. ^ The Cook Political Report (2009). "Partisan Voting Index: Districts of the 111th Congress" (PDF). The Cook Political Report. Retrieved 2011-11-10. ^ "U.S. Decennial Census". United States Census Bureau. Archived from the original on May 12, 2015. Retrieved July 13, 2014. ^ "Historical Census Browser". University of Virginia Library. Retrieved July 13, 2014. ^ "Population of Counties by Decennial Census: 1900 to 1990". United States Census Bureau. Retrieved July 13, 2014. ^ "Census 2000 PHC-T-4. Ranking Tables for Counties: 1990 and 2000" (PDF). United States Census Bureau. Retrieved July 13, 2014. ^ a b c "DP-1 Profile of General Population and Housing Characteristics: 2010 Demographic Profile Data". United States Census Bureau. Retrieved 2015-07-13. ^ "Population, Housing Units, Area, and Density: 2010 - County". United States Census Bureau. Retrieved 2015-07-13. ^ "DP02 SELECTED SOCIAL CHARACTERISTICS IN THE UNITED STATES – 2006-2010 American Community Survey 5-Year Estimates". United States Census Bureau. Retrieved 2015-07-13. ^ "DP03 SELECTED ECONOMIC CHARACTERISTICS – 2006-2010 American Community Survey 5-Year Estimates". United States Census Bureau. Retrieved 2015-07-13. ^ "Religious Congregations & Membership: 2000". Glenmary Research Center. Archived from the original (jpg) on 2006-12-14. Retrieved 2009-04-24. ^ Education, Iowa Department of (2009). "Iowa Educational Directory". Iowa Department of Education. Archived from the original (PDF) on 2010-01-09. Retrieved 2009-12-19. ^ Nodaway Valley Community School District (2014-01-09). "Nodaway Valley CSD". Nodaway Valley Community School District. Retrieved 2014-01-09. ^ Orient-Macksburg Community Schools (2009-11-18). "Orient-Macksburg CSD". Orient-Macksburg Community Schools. Archived from the original on 2009-08-04. Retrieved 2009-12-19. Wikimedia Commons has media related to Adair County, Iowa.